The next session beginning at 2:45 PM was the Dairy Grazing Apprenticeship Program. When we found out that Laura Paine, Program Director of the Dairy Grazing Apprenticeship Program was going to be in Freeport, Maine to work with Wolfe’s Neck Farm to develop a dairy grazing apprentice program there, we made an opening for her to address our Consortium. Jim Cropper introduced Ms. Paine to the conference attendees. Laura opened her presentation explaining that an apprentice program for dairy farmers is becoming important since many farm families do not have a child interested in taking over the family farm to continue the tradition of milking cows. Laura showed why the program got started in Wisconsin by giving us some statistics on the number of dairy and beef grazing farms in WI and where they are located around the State. 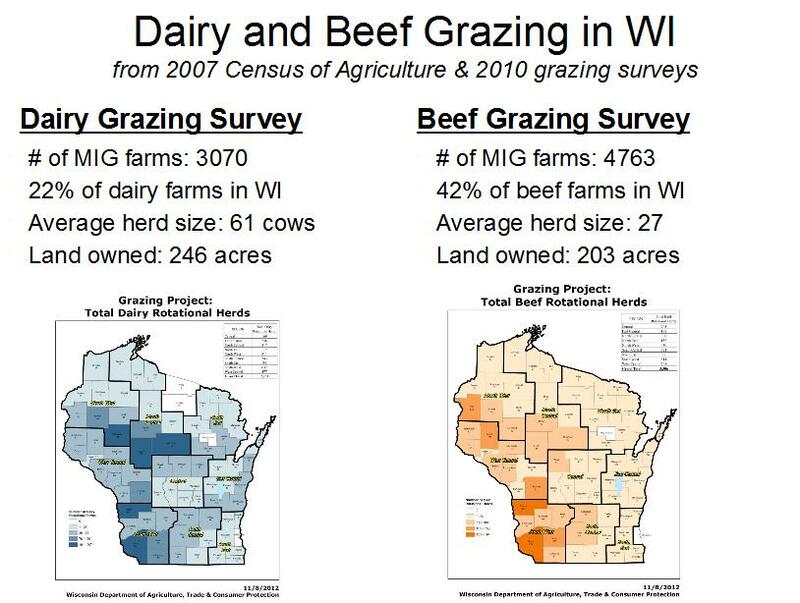 Management Intensive Grazing (rotationally grazed pastures) compose a large number of dairy farms and beef farms in WI. Twenty-two percent of the dairy farms employ management intensive grazing (MiG) while 42% of the beef farms do. WI has over 3000 management intensive grazing dairy farms so in order to retain dairy farms in the State, it was ready to take-on the Case of mentoring and training young people interested in being grazing dairy farmers. Interest is now spreading to other parts of the Nation, such as in Maine, New York, and Pennsylvania, in the Northeast. The concentration of MiG dairy and beef farms are in western WI that has terrain similar to the Northeast being hilly and highly dissected by stream valleys making row cropping challenging. As shown by the statistics in the table above, getting bigger in the dairy industry is not the way to riches. Producing more milk by having more cows is a losing proposition. Confinement of dairy cows causes a big increase in expenses with housing, feeding equipment, and forage harvesting equipment among other things driving up the overhead. Pasture is a much lower cost feedstuff as there is no middle man, the farmer, needed to harvest, store, and feed the forage during the pasture season except for TMR or concentrate supplement feeding back at the barn or feedlot at milking. The cows go and get it themselves. Smaller dairies can be more on top of dairy cow health as they have fewer cows to observe and treat. Then, if it is an organic dairy, there is a premium price for milk over that of conventionally produced milk. As we see from the 2009 data, organic dairy farms in WI got the best income per cow, followed by the grazing dairy, and then all the confinement dairies all over the US. There are several DGA approved apprentice farm sites now around the US with 40 in WI, 14 in MN, 4 in MO, 1 in Maine (Wolfe’s Neck Farm), and 1 in IA. NY and PA are working with DGA to develop partnerships to get approved apprentice farm sites in those two states as well. DGA pairs a Master Dairy Grazer with a Dairy Grazing Apprentice. DGA provides guidance and training documents to both the apprentice and the master dairy grazer, such as reference guides written for both the apprentice and master dairy grazer and a Training Guidelines Handbook. They also have several other brochures and forms to inform and guide potential and actively involved apprentices and master dairy grazers so they know what to do and expect and complete to ensure an adequately trained apprentice is produced. Options for Farm Transfer/ Investment to new dairy farmers is critical as entry costs are high even for grazing-based dairies and there are fewer next generation family members interested in taking over the family dairy farm. Average age of dairy farmers in U.S. is 59 years old. What are their options for farm transfer? The apprenticeship program is one option if they would like to see the dairy farm remain one. What are options for mid-career farmers seeking opportunities to expand and/or invest? Currently, there are 17 paired masters. Two masters seeking to retire and transition the farm to non-family members. Five masters bringing their own family members through the program (six apprentices). Nine mid-career masters training unrelated individuals. One Education farm involved (Wolfe’s Neck - currently two apprentices, planning for 6). Operating in Wisconsin, Minnesota, Missouri, and Maine. 62 approved farm sites; 23 current Master-Apprentice pairs; 7 graduates who now own start-ups, are earning equity, or manage a farm; 80+ are awaiting placement. Training manual, guidebooks, outreach materials. Website with on-line applications and searchable database to facilitate Master-Apprentice matches. Approved vendor for Farm Service Agency’s Financial Management Training Program. DGA has several funding partners: The Brookby Foundation, The Cedar Tree Foundation, The McKnight Foundation, The Otto Bremer Foundation, USDA-NIFA Beginning Farmer and Rancher Development Program, USDA-NRCS Conservation Innovation Grant, Whole Foods Market, WI Department of Agriculture, Trade, and Consumer Protection, and the Wisconsin Farmers Union. They also have several industry sponsors. Jim Cropper thanked Laura for her presentation and having the chance to renew her acquaintance since retiring from USDA-NRCS. They had participated in several grazing conferences over the years and Laura had also worked alongside researchers on stream-side grazing impacts on water quality.